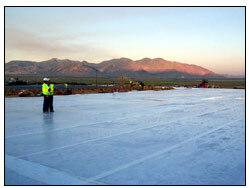 Patented UltraCure™ rolls out evenly and flat providing constant hydration to the slab during the wet curing period. 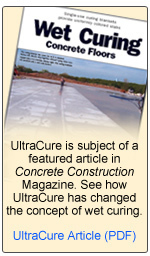 How is UltraCure different from other wet curing methods? Why is it important for the blanket to absorb water? The McTech Group wet curing product line helps contractors and owners create a more durable slab while helping reduce discoloration. Each product is lightweight, requires less material overlap than most other curing methods and was scientifically developed to maintain a 100% relative humidity environment longer than other typical wet curing blankets or methods. According to ACI and PCA, the best possible curing method for highly wear resistant concrete floors is wet curing. Our products are created from proprietary Natural Cellulose Fiber (NCF) based materials that incorporate the super absorption technology used in hygienic applications to wick and hold moisture for long periods of time on concrete surfaces. McTech Group wet curing products are perfect for SOG (gray and colored), RCC, pervious, decorative concrete, and DOT applications. 7 day indoor/outdoor applications. 8 ft. rolls weigh approximately 50 pounds and contain 1,600 sq. ft of curing blanket. Each roll absorbs up to 46 gallons of curing water. The superior water retention ability of UltraCure DOT allows the blanket to absorb up to 55 gallons of curing water per 800 sq. 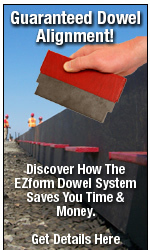 ft. roll, providing the critical moisture required for the long term (up to 14 days) wet curing of concrete surfaces.